Didn't buy it on the stands when you had the chance? We have PEACE PARTY #1 and #2 (and photocopies of PEACE PARTY #0, if you're really curious) available. Professors, teachers, and librarians, ask for our educational discount. Available while supplies last. Our stock of PEACE PARTY #1 and #2 (first edition—a collectors' item) is almost gone, so we've had to raise the price to $4.95. To save money, you may order a photocopy of PEACE PARTY #1 or #2 for $2.95. The photocopied PEACE PARTY #0 is still $2.95. Comics are mailed flat in plastic bags with cardboard backing, and autographed on request. You also have the option of getting PEACE PARTY #1 and #2 (but not #0) on CD. The price for both is $2.95. 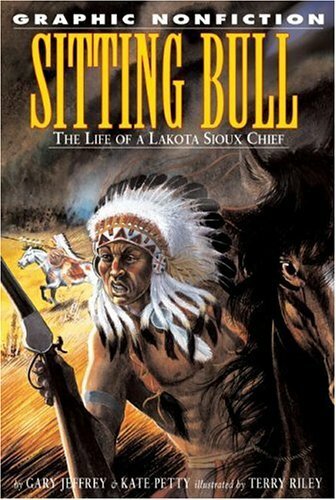 The best books by and about Native Americans as selected by visitors to BlueCornComics.com. Sure to be entertaining and enlightening because our readers say so. Lame Deer: Seeker of Visions—Fire, et al. Prison Writings: My Life Is My Sun Dance—Peltier, et al. For a long list of books by and about Natives, go to The Best Indian Books. 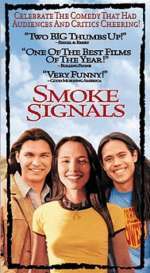 For an almost-complete list of movies by and about Natives, go to The Best Indian Movies. Hundreds of posters by and about Native Americans. From old prints of Caitlin and Remington paintings to classic photographs to modern paintings by Gorman and Silversmith. Check them out at AllPosters.com. Enjoy the graphic artwork people are calling "impressive." The full-color front is guaranteed to brighten any room. 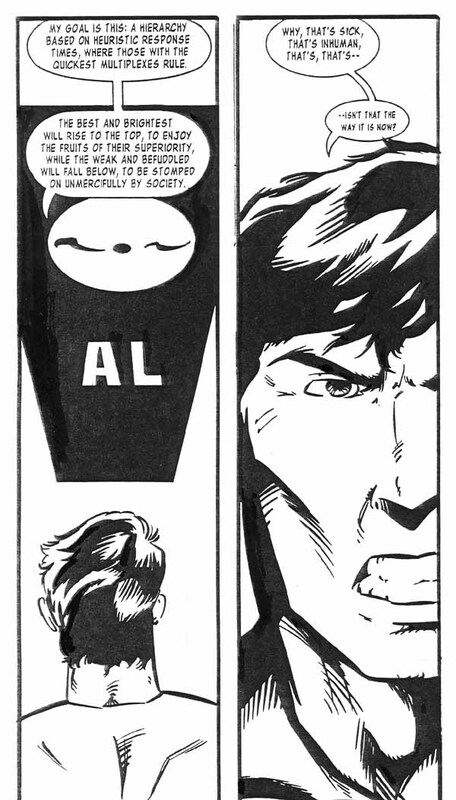 The black-and-white back shows our heroes' genesis (from PEACE PARTY #1) and tells the philosophy of Blue Corn Comics. Only 95 cents each. 8½" x 11" on glossy stock. Mailed flat. Discover the history and theory behind Native-themed comics with these two professional presentations. One is "A History of Natives in Comics"; the other is "Hercules vs. Coyote: Native and American Comics." Gail Stavitsky, chief curator of the Montclair Art Museum, calls these presentations "informative" and "excellent." Only $2.95 each. Shipped via CD. Learn the story behind PEACE PARTY with this CD-based interview. Listen as publisher Rob Schmidt and Cherokee advisor Steve Russell give the inside scoop on where PEACE PARTY came from, what makes it unique, and where it's going. An entertaining look at why PEACE PARTY is the story of the millennium. Only $1.95 each. Playing time is 20 minutes. Get a genuine Indian-style keepsake to complement your Indian-style comic book. Each arrowhead is made of obsidian and hand-carved in Mexico. (An expert supposedly can carve one of these in two minutes.) Makes a great conversation starter, stocking stuffer, or lucky charm. Only 45 cents each. Approx. 1" long and safe for kids—as long as they don't eat them. Not suitable for actual bow-and-arrowing. Rob's other writings on Native Americans. Includes "The Rain Gods Aren't Listening" (The World & I), "Indian Beliefs Still Separate and Unequal" (Oakland Post), "The Whitest Place on Earth?" (LA Reader), "We're All the Same, Only Different Stereotypes" (Indian Country Today), and "Pocahontas: Fact or Fiction?" (American Indian Review). Only 95 cents for the set of five. Magnets: Robot Mangler Order now! Rob's first published comic book (PEACE PARTY #1 is his second) is a rib-tickling parody of MAGNUS: ROBOT FIGHTER. It's a comic so hard to find that we have to sell photocopies. If you like Rob's philosophical bent and, more important, his wicked sense of humor, you'll like this. One satisfied customer said, "WOW. Best Magnus parody ever. Brilliant." Only $1.45 each. A 23-page, high-quality copy as good as the B&W comic itself. Includes two pages of the original script. Signed by the author. More Indian comics Order now! Get NFL SUPERPRO #6, perhaps the most stereotypical comic about Indians since 1990. This comic was so controversial that the Hopi reservation closed its ceremonies to outsiders after its publication. You'll laugh, you'll cry, you'll see how bad a Native-themed comic can be. Only $9.95 each (because of its rarity). All comics are in fine or better condition and come bagged. Get A HERO'S VOICE and DREAMS OF LOOKING UP, two full-color comics from the Mille Lacs Band of Ojibwe. The stories feature realistic, modern-day Indian children getting in touch with their Ojibwe roots. Only $1.95 each. All comics are in fine or better condition and come bagged. Get NATIVE HEART, Robby McMurtry's graphic novel about Cherokee folk hero Ned Christie. The best Native graphic novel I've seen in years. Enjoy great comics from Marvel and other publishers. John Byrne's FANTASTIC FOUR. Walt Simonson's THOR. An X-MEN ANNUAL. John Byrne or Frank Miller on WHAT IF? Jim Starlin's DREADSTAR. SOMERSET HOLMES by Brent Anderson (of ASTRO CITY fame). Guaranteed to be a good read. Only 95 cents each. All comics are in fine or better condition and come bagged. Specify a title or let us pick one for you. Here's the place to order your goodies! Pay with a credit card via PayPal. Call (310) 641-8931 if you have any questions before ordering or want to speak to someone live. The comics are vetted by a Native board of advisors. This website is hosted by a Native-owned business. Preference is given to Native writers and artists. Coming soon (as soon as possible): the PEACE PARTY trade paperback!